Often times we see something in the Bible that may or may not make much sense. 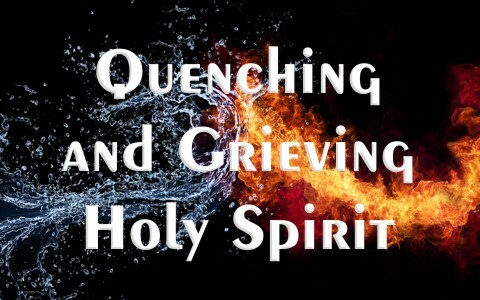 I believe one such thing is the concept of quenching or grieving the Holy Spirit. But are quenching and grieving the Spirit the same thing? Take a look at what I have found in my Bible study on this topic. When you are very thirsty there is nothing that satisfies your thirst more than some fresh, cool water. When you drink that water you “quench” your thirst. That is one definition for quench – to satisfy. Another definition is to “put out or extinguish (fire, flames, etc.)” . This is the definition that we can use when we are speaking of quenching the Spirit. Acts 2:3–4 And there appeared unto them cloven tongues like as of fire, and it sat upon each of them. And they were all filled with the Holy Ghost, and began to speak with other tongues, as the Spirit gave them utterance. The Holy Spirit (the person) lives inside of every true believer. He is the “consuming fire” of God (Hebrews 12:29). That fire inside of the believer is the power that tells us in the way we should go. Though it is as powerful as a burning fire, it is a “still small voice” as well. We can feel His burning within us when He is speaking to us or even urging us to “do something”. He was there on the road to Emmaus with the two disciples and they felt burning in their hearts “And they said one to another, Did not our heart burn within us, while he talked with us by the way, and while he opened to us the scriptures?” (Luke 24:32) He helps us daily to make good choices and when we listen to Him the power and the fire continually leads us to choose right. When we choose not to follow that leading we quench the fire. When we continually “quench” the Spirit we will walk as unbelievers and thereby we do things that grieve the Holy Spirit. … the concepts of quenching and grieving the Holy Spirit we can see great similarities and yet they are different. Ephesians 4:17-19 This I say therefore, and testify in the Lord, that ye henceforth walk not as other Gentiles walk, in the vanity of their mind, Having the understanding darkened, being alienated from the life of God through the ignorance that is in them, because of the blindness of their heart: Who being past feeling have given themselves over unto lasciviousness, to work all uncleanness with greediness. Ephesians 4:25-29 Wherefore putting away lying, speak every man truth with his neighbour: for we are members one of another. Be ye angry, and sin not: let not the sun go down upon your wrath: Neither give place to the devil. Let him that stole steal no more: but rather let him labour, working with his hands the thing which is good, that he may have to give to him that needeth. Let no corrupt communication proceed out of your mouth, but that which is good to the use of edifying, that it may minister grace unto the hearers. So when we look at the concepts of quenching and grieving the Holy Spirit we see great similarities and yet they are different. I see it as a progressive thing. We have Holy Spirit inside of us to guide us and we can choose to ignore Him. Every time we ignore when He tells us to do right, we quench His fire. Making the choice to do what is not right grieves the Spirit because He wants us to do right. He wants us to not only choose Jesus as our Savior but to live in a way that says Jesus is our Lord too (1 Corinthians 12:3). He is the consuming fire that empowers us to “mortify the deeds of the body” and walk with Him (Romans 8:12-14). He is the power that enables us to share our testimony and tell others about Jesus (Acts 1:8). Resource – Scripture quotations are from The Holy Bible, King James Version. Quench. (n.d.). from http://www.dictionary.com/browse/quench. Previous post: How Can Christians Be Holy As God Commands Them? Next post: What Are Reasons Some Christians Doubt Their Salvation?